Treadmills are one of the most popular kinds of fitness equipment for both home and commercial use. At Total Fitness Equipment, we offer an extensive line of name brand treadmills for your home gym or fitness center. Whether you are looking for a high-quality treadmill for your home or a group of treadmills for your commercial facility, we would be happy to help provide the right equipment for you. Treadmills are the number one kind of cardiovascular exercise equipment. They are easy to use and can help you achieve many fitness goals, ranging from weight loss, to improved cardiovascular health, to enhanced fitness endurance, all while within the comfort of your home. If you are a runner, a treadmill will help you keep up with your training schedule even during the cold New England winters. If you are just beginning a fitness routine, a treadmill is a great adaptable piece of fitness equipment. You can begin by walking and gradually work up to a faster pace and longer workouts. These benefits are what make treadmills one of the most popular pieces of home fitness equipment. As a top CT & MA Treadmill and fitness equipment store, we offer a range of high-quality treadmills with all of the features you need to get the most out of your workout. You can choose from treadmills with features such as speed displays, personalized workout programs, and heart rate monitors. Our treadmills also come with excellent safety features, such as emergency stop keys and built-in handrails. If you’re not sure which features you need, one of our expert staff members will be happy to help you. All of our treadmills come from top brands known for reliability and high customer ratings. We offer treadmills made by Precor, Landice, Matrix, and Horizon. These treadmills are all skillfully engineered and are built for long-term durability. Your treadmill will last for years to come. That means that when you purchase a treadmill from us, you can view it as a long-term investment for your health and well-being. If you would like to browse through our selection of treadmills, come visit one of our six showrooms for a personalized tour and demonstration. At Total Fitness Equipment, we offer multiple lines of commercial treadmills designed to stand up to frequent use. Our treadmills are perfect for gyms, fitness centers, schools, hospitals, apartment complexes, hotels, corporations, and other facilities looking to purchase fitness equipment. We sell treadmills from top brands such as Landice, Vision, and SciFit. These treadmills are constructed with parts and hardware made for heavy commercial usage. They provide reliability and durability to make your purchase a smart long-term investment. We offer a full range of treadmills with the different features your clients will want. Available features include emergency stops, heart rate sensors, pre-programmed workout options, and detailed displays. 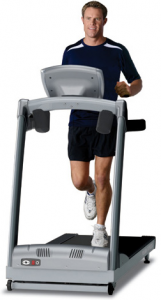 We offer standard treadmills, treadmills with adjustable incline, and rehabilitation treadmills. No matter what you and your clients are looking for, we can help you to choose treadmills that will meet your needs. If you would like to know more about our commercial treadmill options, please call our commercial contact at 860-290-8553.